Does it make any sense to build your own internal software tool, if someone else already did it, and wants you to buy it? 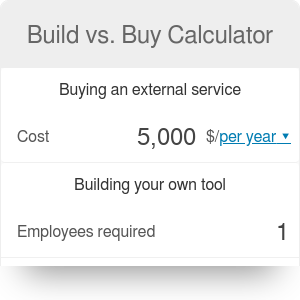 You can find it out with this build vs. buy calculator. In just a few clicks, you will determine what allows you to save more in the long-term perspective: having your developers focus on creating a new piece of software, or paying the license fee. If you decide to get access to an already existing platform that operates in the SaaS (Software as a Service) model, you have to pay a monthly or annual fee. Typically, this is the only cost if you settle for an external service. OV are the overhead costs (e.g., insurances), expressed as a percentage of the gross salary. If you only know the hourly salary of your employee, you can use this hourly to salary calculator. 5 is the number of working days in a week. Building your own software is a form of investment. Instead of having a recurring cost of a license, you have to invest a large sum at the beginning. It means that, if you only planned to use the software once, it wouldn't make any sense to build it. The benefits only appear with time - the longer you use your own product, the less you pay in total. If you're going to reach the break-even in under three years, it's profitable to build the software tool, as it will most probably turn out to be a good investment in the long run. The later the break-even occurs, the higher the probability that you will switch to some other product, or maybe not need it anymore. Build vs. Buy Calculator can be embedded on your website to enrich the content you wrote and make it easier for your visitors to understand your message.